alicia policia: Happy Birthday to Me! Woo-hoo! It's my birthday! I'm three decades old today. Yup. There it is. A three in front of a zero. Hmm.... Yep-eroony. How about that... Happy birthday to me, then! 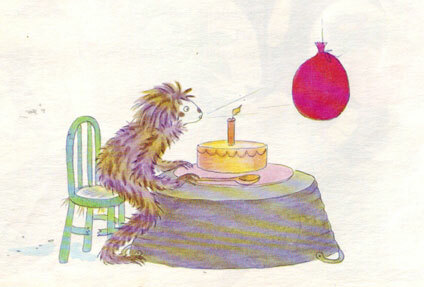 It so happens that every time I hear or think of the phrase 'Happy Birthday to me,' I think of the above image. It's from a book that was a family favorite in our house when my brothers and I were wee kids, Sloth's Birthday Party by Diane Redfield Massie. 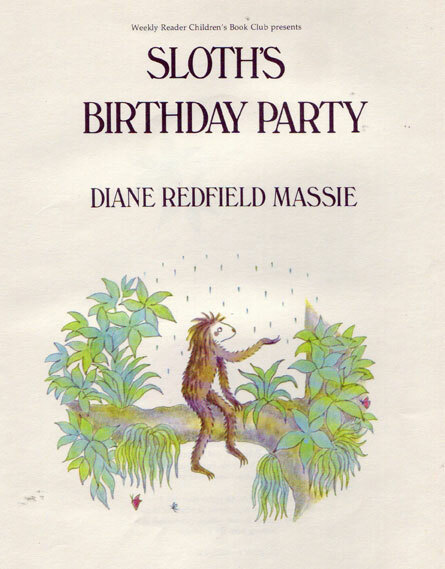 Rainy birthdays always remind me of Sloth! 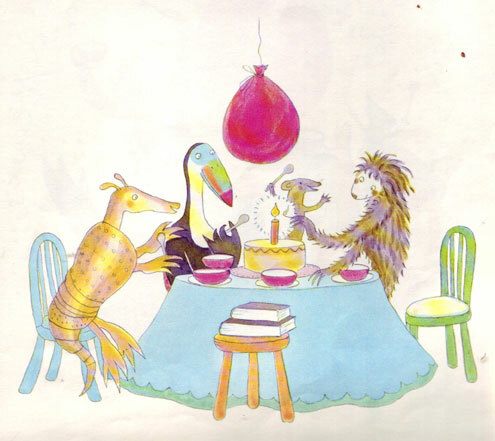 It's not a famous classic children's book or anything, but I remember it as sweet and funny, and I loved the drawings. Funny how they stick with you all these years later. Anyway, if you should ever find a copy, I recommend picking it up. I thought this book was incredibly appropriate for me this year though, seeing as 1) today is my birthday (happy birthday to me, again! 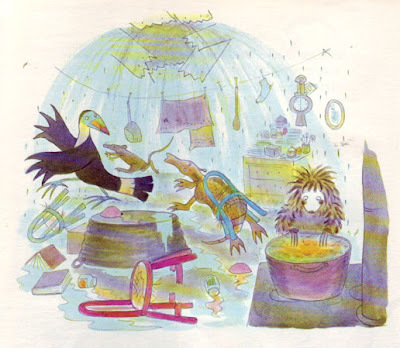 ), 2) it's been raining a LOT round here (pouring, really) and 3) my house, much like Sloth's, is a mess. That's exactly what my kitchen looks like! (Not really, but metaphorically, yes). And much like Sloth I have magnificent friends to help me celebrate my birthday despite the rain and my messiness. Did anyone else out there have this book? Any other people have obscure favorite childhood books that no one else has ever heard of? I love to find good books that aren't your standard 'Goodnight, Moon' or the like. Plus, I've got some birthday money to burn, perhaps on some good books, perhaps not. But I am a sucker for a good children's book, that's for sure. One of my mom's favorites to read to her tads? "Stand Back," Said the Elephant, "I'm Going to Sneeze!" . Ahh, the memories! Oh, I love that book! I just ran into it at the thrift store after months of thinking about it. To this day, I enjoy drinking out of jelly jars.